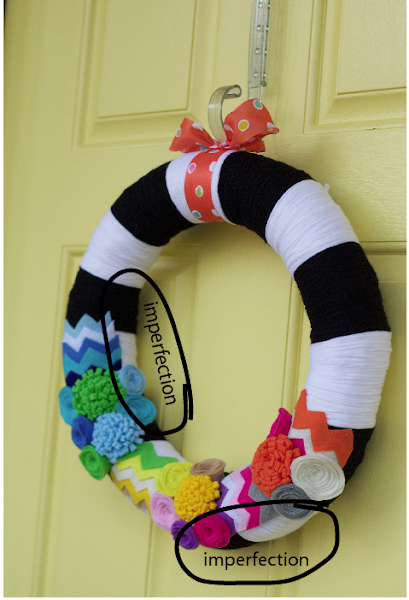 Last week I completed this wreath for my front door. And actually, after finishing it couldn't decide if I really wanted to hang it outside or not. It was so stinkin' cute I kinda wanted to have it inside to see. But I went ahead and opted to hang it on the door like I planned to do from the start. I'm thinking I could eat it though! Originally, I got this idea from Pinterest when a friend pinned this wreath. I loved the black & white_ the bright colors_ the chevron_ pretty much everything about it and couldn't wait to get busy making one for myself! So I switched it up a bit and what follows is a quick tutorial on what I used and how I made my version. Felt in all different colors. I used about 16 different colors. 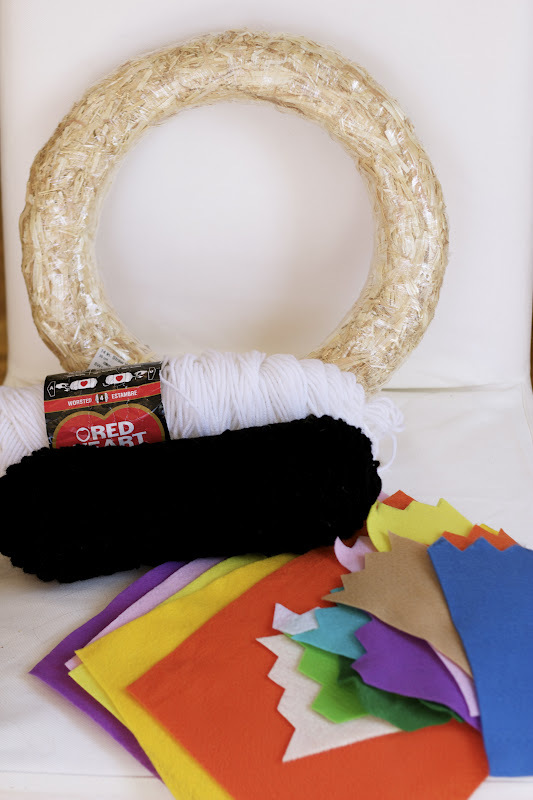 First you'll need to mark off sections on your wreath to know where and when to stop your color to then pick up with the next color in rotation. Mine were a little over 1' sections making sure that I would not end up with the same color side by side. 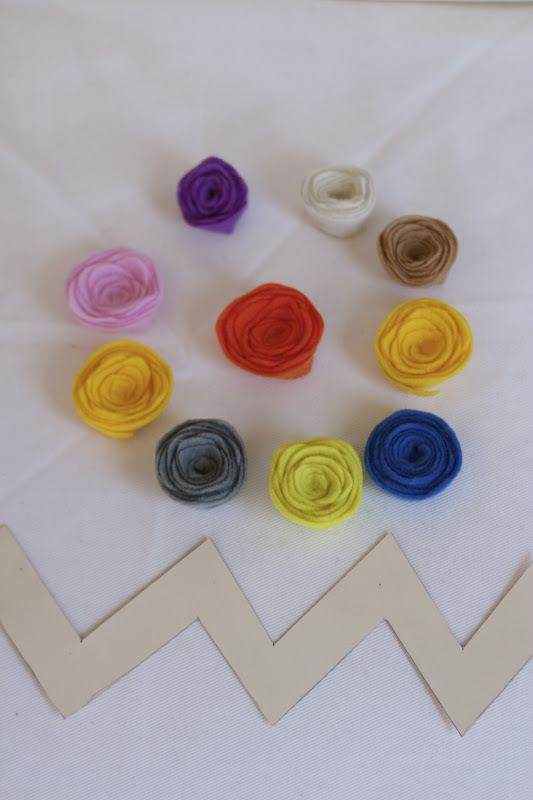 Next I made a bunch of felt flowers in different shapes/ sizes. If you've never made a felt flower before just google how. There are a ton of tutorials out that are amazing at showing you how. With some cardboard I drew and cut out a chevron stencil to trace onto each piece of felt. Then after making all of my flowers and cutting out all of the chevron pieces I just hot glued everything. Matching up the colors like I wanted with the chevron, then placing the flowers and gluing once the chevron pieces had all been glued down first. Now let me tell you what I would do differently after making my first one. 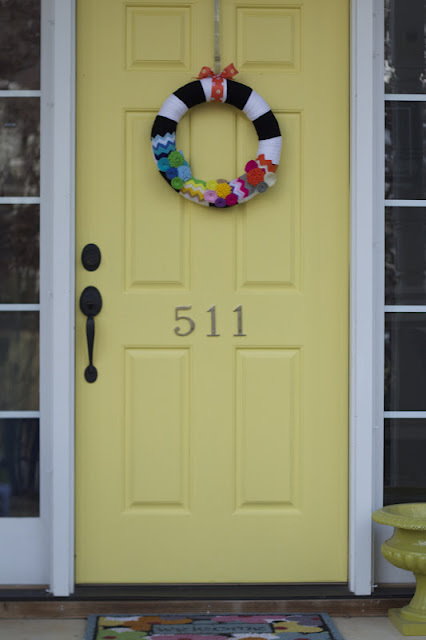 The chevron needed to be wider so that it wrapped around the wreath more. I would of liked it to cover more on each side/end but it was something I didn't realize until I had gotten them on there. So I had to just go with it. Looking at the wreath head on you really don't notice it. It's only after you get upon it that you can tell. I seriously love it though. It's definitely a happy wreath. That ba-boom piece that I can't wait to see as I pull into the driveway. 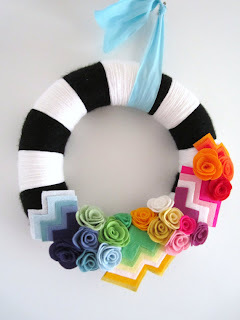 Because wreaths and felt and flowers and chevron and color all help make life a little sweeter. It's so bright and cheerful! I love it!!!! i saw your wreath on pinterest. it's beautiful. The HAPPIEST front door I've ever seen! Adore. oh my.. I love it! I can't wait til I have time to try and make one! stumbled onto your blog and just wanted to leave you a little blog luv! Def enjoyed reading this post!! i am def in love with what you made! very cute and i love all the colors! Seriously. LOVE. So creative. So bright and cheery! 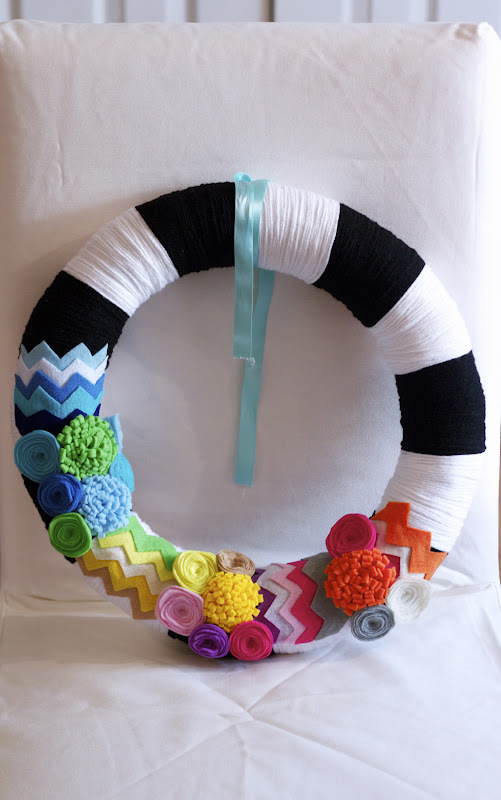 How fun is your wreath?!?! Love it! Great job! OMGoodness, that is AWESOME!! You did a great job!! 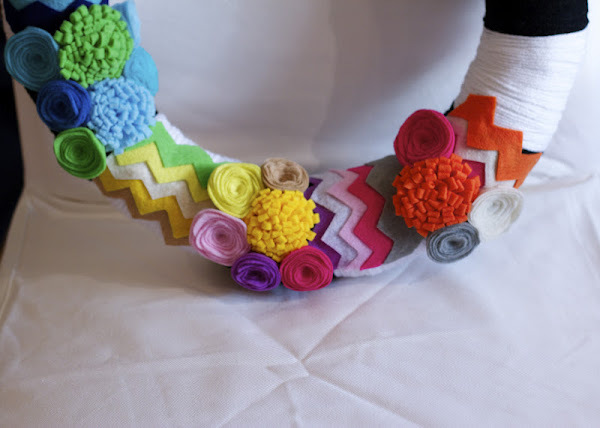 I have a confession..I haven't cared for all the chevron out there in blog land this last yr, but THIS has changed my mind!!! SO much that I may just have to make one myself! oh my goodness! I love it! so stinkin cute! good gosh that is so flippin cute. I will take it off your hands....gladly!! !